Michael Zeto of AT&T and former Founder and CEO of Proximus Mobility (sold) kicking things off for Mobility LIVE! Day 2’s keynote! Yesterday’s post for Day 1 was much longer than I wanted to type, but it happened, and now I’m afraid of this post because… well, like I said, it’s a full-day rather than the half-day of yesterday. Let’s cut to the chase, that’s all you want to read anyways! 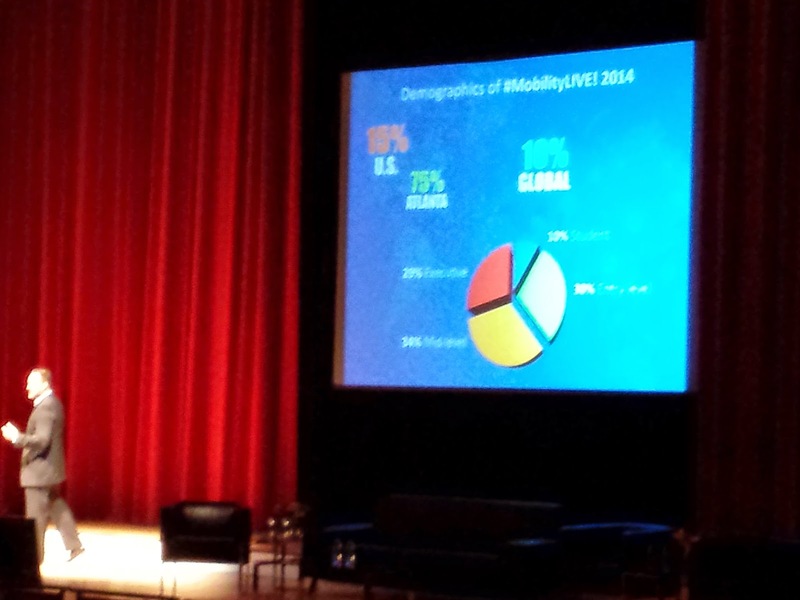 Keynote spearheaded by Michael Zeto of AT&T (former CEO of Proximus Mobility — acquired in 2013). Zeto touched on the many strengths of Atlanta as the central hub of the growth and evolution of Mobility. Razorfish, the marketing/ digital advertising/ etc. agency, is spearheading the Atlanta Pulse initiative to bring together all the happenings around Atlanta into a common platform. Gone are the days (to come anyways) of searching Facebook for what friends are recommending, Yelp! for restaurants, etc. David Christopher, CMO of AT&T Mobility, shared some of the Top 5 trends he and the company sees during the keynote. For Relationship Marketing, the key is marketing at SCALE! That is, how are organizations reaching consumers on a relevant, personable context? Customers believe word-of-mouth over advertising to the tune of 92%! Smarter smartphones really involves making the smartphone the keystone to everyday life including, but not limited to: the connected home, car, TV, music, health, etc. David talked about FIXD, a startup by several Georgia Tech grads who have introduced a way to plug a dongle to the car’s OBD port that sends data to your smartphone to share information including if you have a warning light — what’s that mean? What’s the impact if you ignore? What’s the potential repair estimate? etc. Jeff Mitchell, Vice President of Sales of AirWatch got some airtime to share a couple tidbits, too. Panel included: Troy Brown of MSL Group (a PR agency) who is bringing app development (and really acumen) to the agency; Sanarr McLaughlin is the Manager of Interactive Marketing for InterContinental Hotels Group (IHG); Chris Bigda of The Coca-Cola Company over Connections Planning and Investments; Lisa Cantrell of Turner Broadcasting serving as the Director of Digital Strategy and Activations; and Erin Arnett, an Account Director of Yahoo! Lisa must consider the sizeable and highly variable audience to which Turner broadcasts to with channels including CNN, TBS, Cartoon Network, Adult Swim, etc. There’s a growing interest and attention in anonymous content. Think: Snapchat (kind of), [Atlanta’s own] Yik Yak, etc. Great. I just wrote another lengthy post… I didn’t even attend the last two session rounds, either. This was more or less an extrapolation of my notes I took. Very interesting insights, and I’ll need a few days (probably a week for next week’s blog post since I just wrote two this week for this) to digest and share my own personal thoughts. Overall, really great event, and I’m excited it’s mobilizing Atlanta’s influential companies to gather and share. I attended the event for some additional inspiration in addition to satiate my technological interest. I’m looking forward to the event’s growth next year with perhaps some additional, event-friendly venues (you should use local startup Gather to help, Metro Atlanta Chamber!) as well as integrating some more startup companies — mostly early-stage as the there were a number of advanced startups present. Adding in some foreign companies (beyond Georgian borders) will be good, too. Also, event somewhat aside, it’s evident Atlanta is indeed sitting on the cutting edge and as a central hub for the mobile (r-)evolution. It’s exciting to hear all the stats beyond shown up on the projectors for all the great things Atlanta is being known for as well as the growth of the industry and the opportunities that abound for this great city. Heck, just look around at all the recruiting companies in attendance. Also, shout out to my under grad alma mater The Georgia Institute of Technology for getting all sorts of recognition and a source for a lot of the innovation happening in mobile. You could really see and hear and really witness how Georgia Tech is a major catalyst for the ecosystem. It’s all great news for not just Atlanta and the state of Georgia, but also for the country and the world. To next year’s Mobility LIVE! conference! See you there.